The Smile was never terribly busy that winter and spring (1985). The one exception was every Saturday after the morning function let out. The Smile was a natural place for the out-of-town disciples visiting Guru to congregate for lunch. On top of that, Guru's long-standing rule had been that visitors only paid half-price at the Smile on weekends. A pretty sweet deal that guaranteed a crowd of mostly ravenous Canadians. So, when Guru left the tennis court on Saturday, the Smile became a zoo. It would become so busy that there was little reason for me, as a waiter, to panic. Instead, in a workmanlike way, I had to take orders and chip away at the crowd as best I could. Patience and poise were the watchwords. Only one thing could make such a situation worse: a visit by Guru. That's exactly what happened one morning that March. Though Guru had a dedicated table at the Smile, it seemed to be more of a shrine than an actual place for him to eat. I'm not sure anyone -- except, perhaps, Shushoban -- knew when Guru had last come into the Smile. It had been years. His presence, however, made things in the Smile that morning much more stressful for us workers. Shushoban rushed over to seat Guru and take his order. Shushoban would now be working only on Guru's food -- all other grill orders would have to wait (and there were a lot of them). Luckily, the visiting disciples crammed into the Smile that morning were happy to wait in Guru's presence. Nevertheless, I began the task of taking orders. As I walked past Guru's table to serve some of the disciples seated nearby, though, Guru called me over. With outstretched hand, he gave me a piece of paper. He told me to put the paper on my shrine at home and meditate for 10 minutes before looking at it. Out of the blue, I had received my name. Still standing there in front of Guru's table, I looked around at the crowd. "Guru," I asked tentatively, "should I go now?" "Yes, go now," he responded. Sorry (sort of) to abandon my mates in the middle of a rush like that, I tore my apron off and ran the half block to Databir's place (where I had been staying since December). 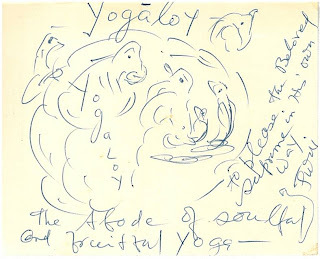 I sat before my shrine for 10 minutes, too excited to meditate successfully, and then I was Yogaloy: the Abode of Soulful and Fruitful Yoga to please the Beloved Supreme in His own way."